Often overlooked, setting the tracking your cartridge weight and balancing your tonearm may sound dry, but it’s about the single most important adjustment you can make to the way your turntable sounds and will save both your needle and your records in the process. We take you through the deceptively simple process, step-by-step. This feature will guide you through the process of setting the tracking force of a cartridge on a turntable. Before I begin I want to recommend two very important things. Firstly: be patient. Do not rush this process. In fact, force yourself to slow down and concentrate to prevent accidents. Secondly, if you read the following instructions and your turntable manufacturer recommends a method that contradicts my own then follow the manufacturer’s instructions instead. There may be a very good design reason why we differ. Some turntables require that you install the tonearm onto the turntable itself, others demand that you attach the cartridge to the arm. This is a beginner’s guide so I’m going to assume that both of these tasks have been done for you, as is frequently common nowadays, by the manufacturer. The likes of Pro-Ject, Rega and others like to promote a ‘plug and play’ (well, almost) philosophy to make turntable set-up as easy and as painless as possible, so they will have completed both tasks for you. Why do we set a tracking weight at all? To allow the stylus to faithfully track the grooves in the intended manner. The tracking weight varies because arm and cartridge weights vary. If the tracking weight on your stylus is too low, it will cause the stylus to jump and damage your record (which is why too low a weight is more harmful that too high a weight). If you set the tracking weight too high, the stylus will not track the grooves correctly, losing information while aural distortion will often be evident too and, again, there’s a possibility of record damage, over an extended period. If you read standard tracking weight instructions, you will find a recommend range of tracking weight figures from the manufacturer. If you stick with somewhere in-between then you won’t go far wrong (i.e. for a recommended range of 1.6g-2.g, go for 1.8g). Get started below. If you get stuck, you can check the interactive image above for reference. NB: We’ve roughly based our example on a Technics SL-1200, but most turntables will have a similar or equivalent set-up. Look for the anti-skate control. This can either be a rotating wheel featuring a numbered display or a piece of fishing-type wire with a weight hanging off the end that sits on a bar or some-such on or around the arm (your turntable’s instructions will guide you to what position corresponds to what setting). Set anti-skating to zero. Your arm may be secured to a supporting yoke, midway along its length, via a plastic hook or latch or similar. This is the arm rest that you normally use as a sort of home base in between vinyl plays. Unhook this yoke, lift it off the rest, support the arm to prevent the stylus crashing into the platter for now and lower any supplied arm lift. Move the rear-mounted counterweight backwards and forwards along the length of the arm until the arm lifts off the arm rest and freely (without any support from yourself) hangs in a level position. Your arm now has an effective tracking weight of 0g. Tighten the locking nut to stop the counter-weight sliding but not enough that you can’t move it with light pressure for fine adjustments. Because the tracking weight, in this finely balanced position, is effectively 0g, you can now locate the arm tracking weight dial which normally sits at the rear of the arm, possibly on the moveable counter-weight itself. Move the dial to zero. Not every arm will arrive with a convenient dial. If there is no dial, don’t worry. Buy yourself a tracking weight gauge to provide confirmation of the desired weight. If the counterweight is on a screw thread, rotate it (which also moves the dial) to the desired tracking weight. If your arm has no counter-weight dial or screw thread, rest the tracking weight gauge on the platter and the stylus on the gauge. Edge the counterweight backwards and forwards to the suitable tracking weight. The gauge’s read-out will tell you when you have found the correct weight. 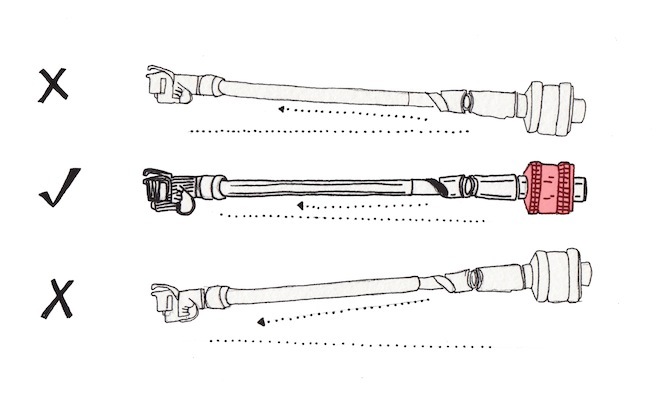 Return and secure the tonearm. Set the anti-skating device to the same figure as your arm’s tracking weight. 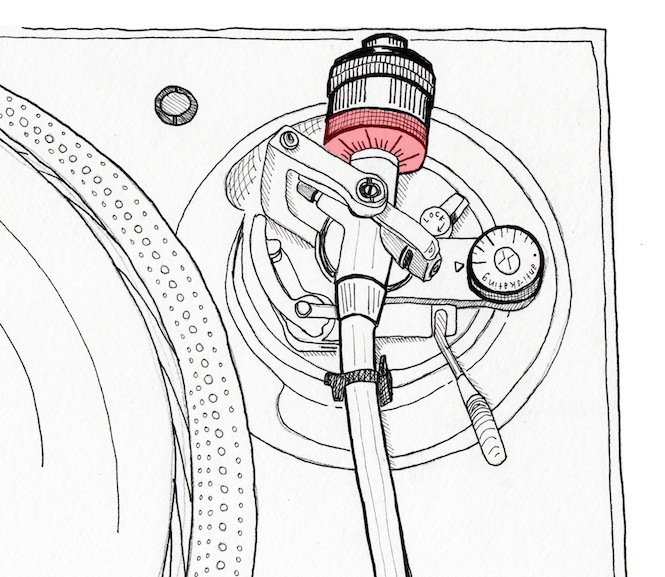 This device adds a force to your tonearm preventing it from skipping (or ‘skating’ across) the grooves. It pulls the tonearm out a little bit, effectively balancing the stylus forces in the groove. That’s it! You’re done. 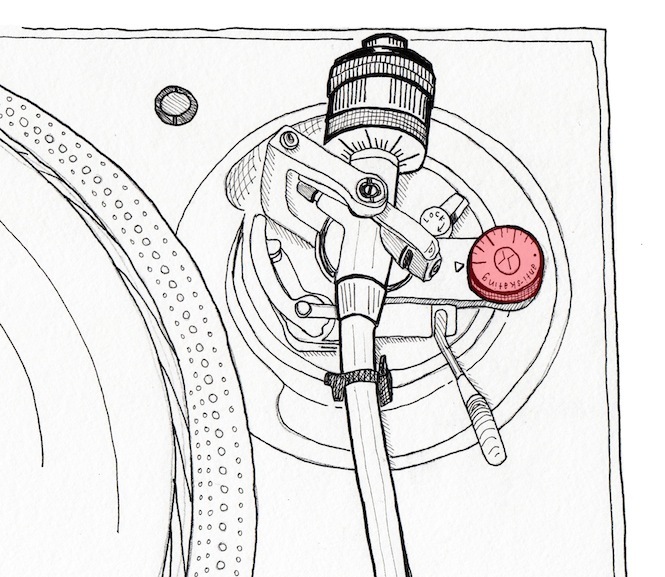 Further reading: Check out our full interactive and annotated guide to all the bits on your turntable here.